At Chhaperia, the standard work culture drives everyone to produce the best always. 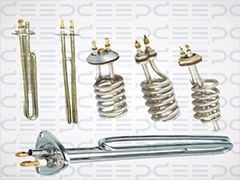 Now, it heads as geyser heating element suppliers with advanced power saving modes. The geyser installations keep on increasing year by year. Chhaperia remains unbeatable in manufacturing heating elements and electrical heating elements for products like a heater for a toaster, hand dryer, hair dryer, defrost refrigerators, warming appliances, electric tiffin box, air fryer, and many more. The industry to meet the needs of a common man, it continues to keep its efforts in manufacturing various electro-powered heating elements. Two thermostats at different levels placed in, to heat the water. Thermostats heat the water based on the temperature value we set. An insulating material covers the entire geyser. As geyser heating element suppliers, Chhaperia makes a move in the core of excellence. It’s because of the reasonable price and quality-rich in the product. We continue to provide the best services by optimizing and innovating the products.